Interested in rushing with AXS? 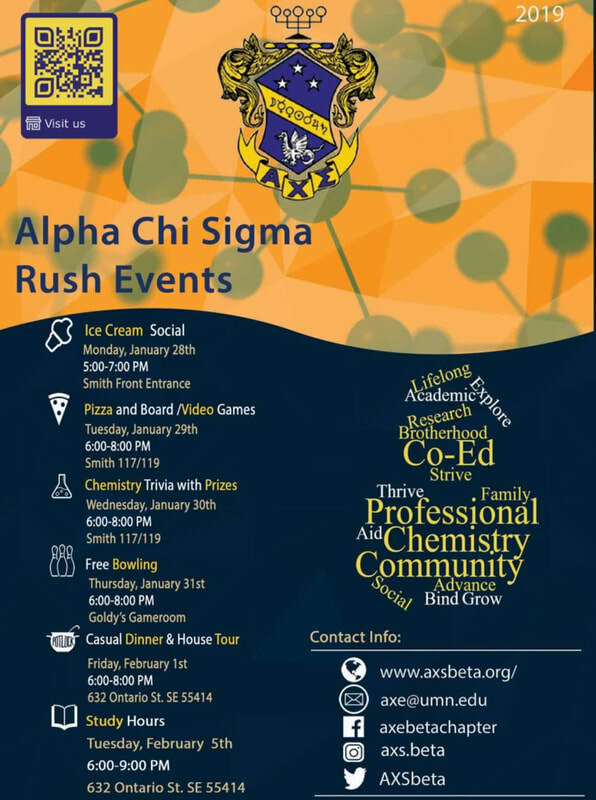 Alpha Chi Sigma (AXS or commonly referred to by members as AXΣ) is a co-ed professional fraternity focused on Chemistry, but it’s also a lot more than that. It’s a place to make friends with people from a variety of majors, who share a common interest. It’s a way to get involved with the University of Minnesota Twin Cities community. It provides an opportunity to use a vast network of academic and professional contacts to prepare for your future and gain new friendships along the way. In AXΣ, you can do anything from studying for your Organic Chemistry final, to going out and dominating a massive Chipotle burrito, to playing a fun game of Cards Against Humanity with your fraternal Brothers. Is rushing AXΣ the best decision you’ll ever make? Of course not; that would be ridiculous. But it comes pretty close. At minimum, you will have taken at least one semester’s worth of a college level chemistry course. If you can meet or exceed these requirements, you may Rush! What and where are the Rush events? Rush events occur every semester within the first couple weeks of the semester. They are a fun way for members and pledges to get to know one another, and are free. Events often include making liquid nitrogen ice cream, bowling, eating pizza, playing board games, and much more! A picture of our events for that semester are posted to this website as soon as they are created. Please check at the beginning of the semester for updates. Events are held at Smith Hall, Bruininks Hall and the AXS House. Can't make it to any of our Rush events? Then please feel free to contact us and set up an interview with our Vice Master Alchemist. We would thoroughly enjoy meeting you and taking the opportunity to find out more about you. Interviews are casual and a great way to make a first impression!